We have the perfect location to relax and enjoy the scenic Maine coast. This is a nicely furnished, ground-floor, studio apartment in a two story house. We overlook Hopkins Island and Dingley Cove and the picturesque Maine shorelines beyond. If you are kayakers you can launch your kayak from our yard; we are in a well protected area with wonderful shores to explore..
Hopkins View has a large, fully-equipped kitchen (including dishwasher) and dining area and a bathroom with a tub and shower. The living room has a couch and a love-seat with views out a picture window. The bedroom which has just three walls (thus we must call this a studio...open on the living room side) has a quality queen-size bed. You are just feet from the water (really makes us a special location) and can watch the active lobstering, recreational boating, and coastal wildlife. You have use of a BBQ and a small yard for sitting outside or eating at your picnic table. You'll enjoy lovely sunrises and beautiful evening light. We are the perfect spot to launch your kayak or canoe. The islands and coast in our area are perfect for exploring. A small public boat ramp is two blocks away. And we have a deep water mooring; ask about it if interested. Take a walk into Cundy's Harbor. Buy your fresh lobsters at Watson's General Store and have them in a pot in minutes. (You can walk down to the water and choose yours right out of the holding box.) Cundy's Harbor is a gem! A quaint, active fishing harbor with a small summer restaurant on the wharf, a cute gift shop and little general store. We are located between the Portland/Casco Bay area to our south and the Midcoast Maine area just to our north. Makes us a perfect location for day trips. Bath, Wiscassett, Boothbay, Camden, Portland, Freeport, etc. etc. Museums, hiking, antiquing, eating, shopping, exploring villages and coastline...and much more. PLEASE NOTE: We have optional fees for use of our sheets and towels if you would prefer not to bring your own, and we offer post-stay cleaning if you would rather not do the cleaning as described in our Rental Agreement. (Renters are asked to leave Hopkins View as clean as they found it unless they pay the cleaning fee.) During your inquiry, please let us know if you are interested in the linens or cleaning option; if not, we can remove those fees from the Quote. There is a upstairs apartment that sleeps 2-4 and a cottage next door that sleeps six... could be a great setup for a couple families wanting to be near... but not too close. 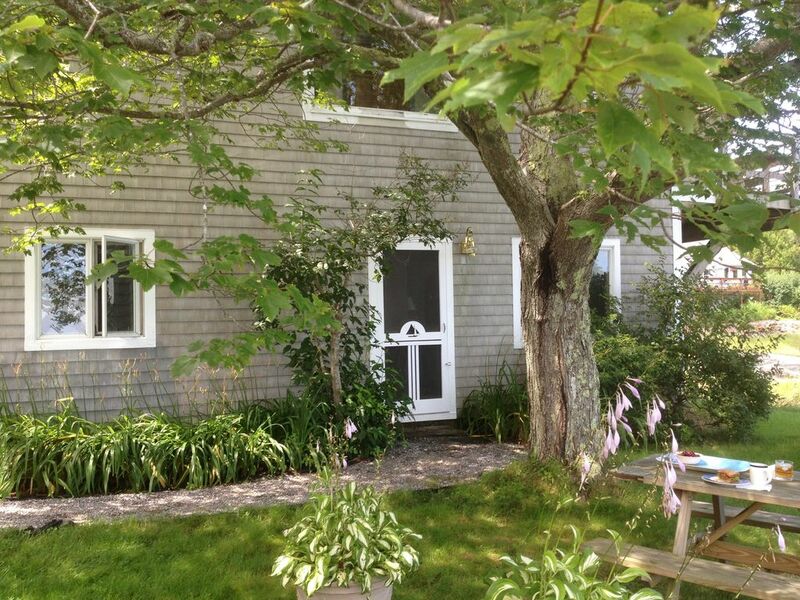 VRBO #s 24126 and 24124. .
Our family has enjoyed welcoming visitors to our lovely spot on the coast of Maine. This has been a family project and we each have had a hand in making Hopkins View a comfortable and welcoming home-away-from-home. One step up into the bathroom from the living area. Cindy's Harbor is an active lobstering and fishing village. Water is 15 feet away. It's fun to see the tide rise and fall. This area is protected and gets only gentle waves. We are feet from the water...really a special spot. Blankets and pillows provided. Sheets and towels can be provide for a $25 fee. Starter amounts of cooking oil, seasonings, and paper products. Cleaning supplies provided. We have an HDMI cable to connect your PC with the television. Small yard with picnic table and 2 chairs. Beautiful view Quiet cove and great local food. Great peaceful relaxing. We really enjoyed our stay. Will be returning next year. I love Hopkins View! This place is the perfect size for one person or a couple. The layout of the unit is great -- no wasted space, but it doesn't feel cramped at all. The kitchen in particular is very well equipped, which is important to me as I do all of my own cooking on vacation. I was a little concerned that it might not feel very private, especially in the outdoor areas, but the way the units are set up, everyone gets a little spot to sit and enjoy the water without having to be right in their neighbor's faces. It felt much more secluded than it actually was. Everything was very clean and comfy, and there were helpful notes all over the unit, which minimized the "how does this work" confusion that comes with staying in a house for the first time. All in all a fabulous experience! This is a VRBO/HomeAway insurance option that is part of their routine communication. I can understand how this could look like something required or expected. Please choose and pay for this only when you want it. I will communicate with this visitor and suggest they speak to the VRBO Customer Support people who are always helpful. The owners are terrific, very helpful. This is our third year staying with them. The area is very quiet, but also quite active. There is a tranquil peacefulness in this little town. The house is cozy and comfortable. Water access is literally twenty steps out the door. We bring our own kayaks and love to get out and see the water birds and this year we saw seals again! The people we pass in our boats are friendly too. A few of our favorite things include the Island Candy shop on Orr's Island (their pistachio brittle, salted caramels and Shane's of Maine blueberry ice cream are my favorites), Bow Street Market (the best natural, fresh and local foods available) in Freeport (and Bean's, love them too!). Bissell Brothers brewery in Portland, if you like craft beer, is the best around. There are so many other great places to visit too. We've already asked for our 2019 dates to be held! Can't wait to return! Thanks for these fun destination suggestions. And we agree, the kayaking is wonderful in our area. Our second time was even better than the first! We'd rented this cozy apartment a few years ago and we were thrilled to return because it is the perfect place to spend a week. The last time we visited, we didn't own kayaks, but rented them in town one day, wishing we could explore around our little corner of Cundy's Harbor. We've since bought our own and loved going out in different directions from our back door each day. We enjoyed ourselves so much, we only left Harpswell one time during the week - that was to visit the beautiful Coastal Maine Botanical Garden, less than an hour away and definitely worth visiting. The rest of the time, we explored the 3 "fingers" of Harpswell, hiking the pretty trails, kayaking from our back door, watching the lobster boats, enjoying the unbelievably beautiful view from the yard or from the comfortable furniture in the living room, eating fresh lobster, and generally relaxing. We have rented many vacation homes and this is among the best! The place is sparkling clean, the kitchen has everything you need and is easy to work in, the bathroom is spacious, the bed comfortable. I hesitate to give it such a glowing review because we'd like to keep the place a secret, but we can't praise it enough. The owners are responsive and have done everything possible to make their home as welcoming as possible. If you're looking for a quiet, peaceful vacation, close to many things to do, but a world away, this is the place. We have the perfect place to launch your kayak or canoe. Theater and Arts at Bowdoin College, 25 minutes to LL Bean (Freeport), Lots of day-trip opportunities to Kennebunk, Camden, Bath, Wiscasset, Portland and all of Mid-Coast Maine. Explore the rocks. Drive to wonderful nature and scenic walks nearby. Seafood restaurants of all kinds. PLEASE NOTE: We have optional fees for use of our sheets and towels if you would prefer not to bring your own, and we offer post-stay cleaning if you would rather not do the cleaning as described in our Rental Agreement. (Renters are asked to leave Osprey's Nest as clean as they found it unless they pay the cleaning fee.) During your inquiry, please let us know if you are interested in the linens or cleaning option; if not, we can remove those fees from the Quote. Note: Saturday is our normal turnover day. We can accommodate arrivals and departures on other days. Shorter stays Spring & Fall are sometimes possible.